President Rajapaksa, apprising the Namibian Prime Minister of the progress achieved by Sri Lanka following the end of the conflict, pointed out that the country has done much work in the areas of resettling internally displaced persons, rehabilitating and reintegrating ex-combatants, releasing ex-child soldiers and developing infrastructure within a short span of time. 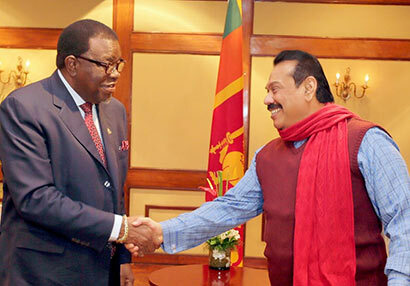 The Namibian Prime Minister, explaining the similar situation his country is faced with, expressed his gratitude to President Rajapaksa for Sri Lanka’s assistance extended towards Namibia. Minister of External Affairs Prof. G.L. Peiris, Secretary to the President Mr. Lalith Weeratunga, Secretary to the Ministry of External Affairs Mrs. Kshenuka Senewiratne, Sri Lanka’s Permanent Representative to the United Nations Dr. Palitha Kohona and Sri Lanka’s Ambassador in Cuba Mr. Sarath Dissanayake were also present at the discussion.